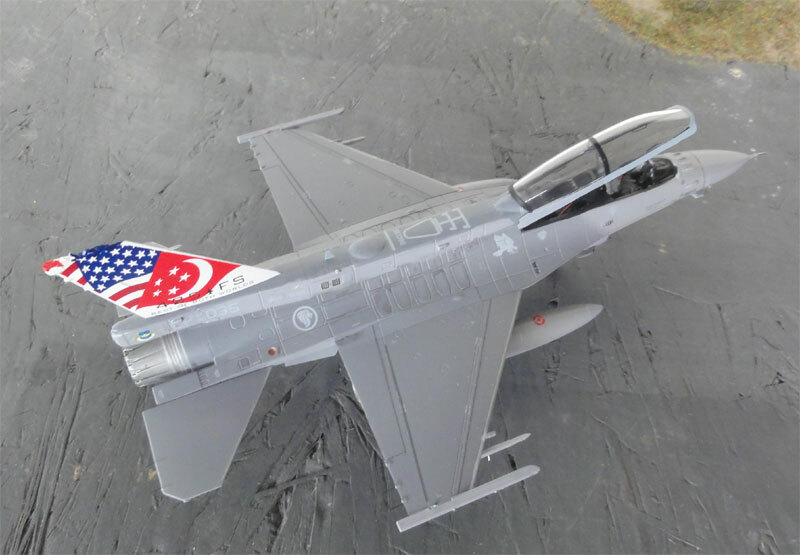 In 2014 I purchased a couple of KINETIC F-16D Block 52+ kits no. #K72002 in 1/72 scale. The first release was kit no. 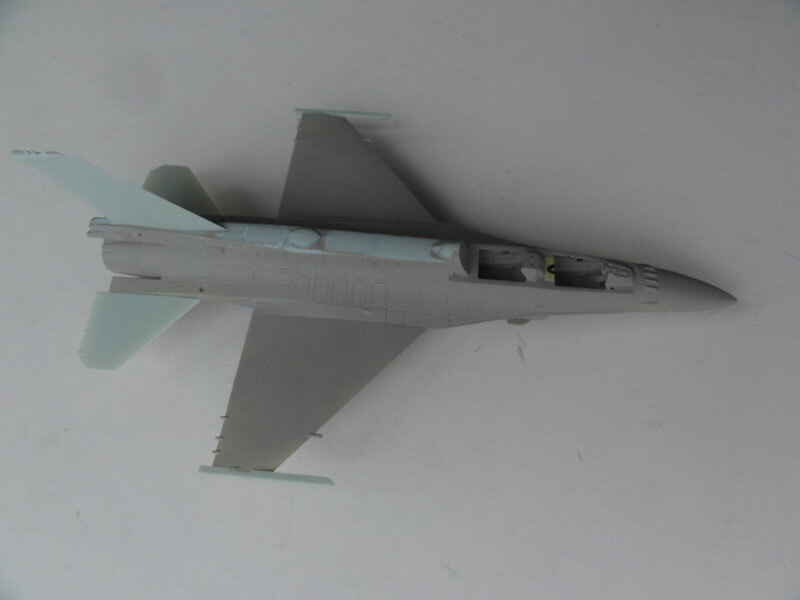 #72001 for an Israeli F-16I SUFA version with some extra specific parts. 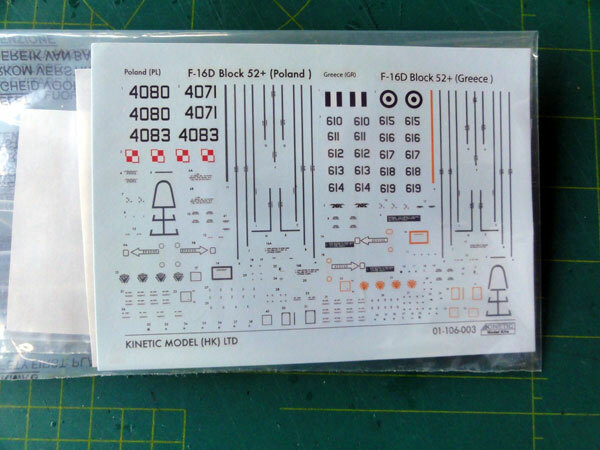 The purchased KINETIC kit release has markings for a Greek "Hellenic" F-16D Block 52 or a Polish F-16D Block 52. The correct smaller original type air intake is in the kit (for the updated Pratt and Whitney F100-PW-229 engine with 29,000 lbs of thrust). (its wide is about 17 mm in 1/72 scale). The appropriate exhaust is simple, has no internal detail but there is a deep pipe with afterburner ring moulded. The plastic parts are in different colours. 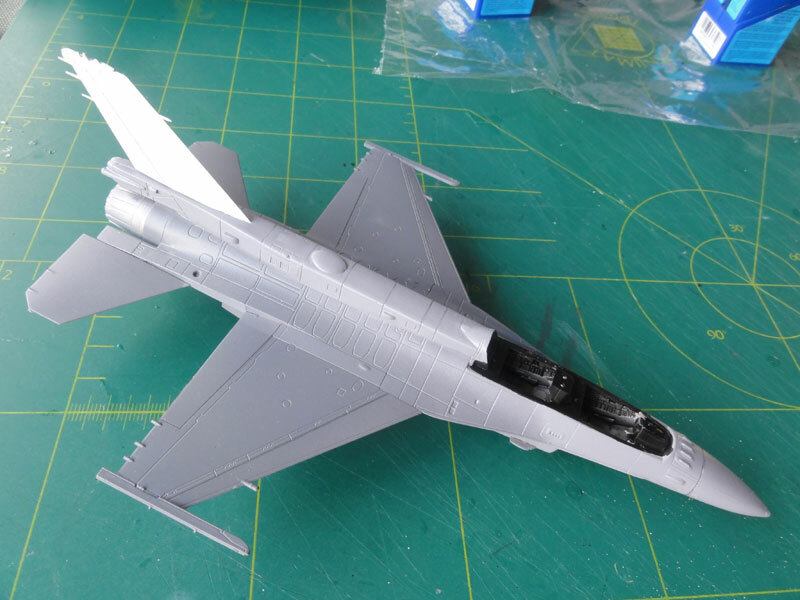 The kit looks a bit rough in areas with some deep panellines for 1/72 scale but shapes look good for a more advanced F-16 Viper. The instructions in my kit were A5 format and rather small but I understand later kits had A4 sized instructions. 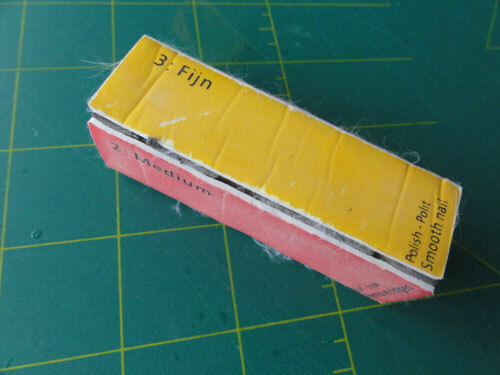 Colours are indicated in Fed.Std FS numbers for each (detail) part in the kit instructions. The instructions though have some smaller errors and do e.g not indicate some alternative parts although they are provided in the kit and seen on the sprues! Part numbers are not seen on the sprue layout drawing. 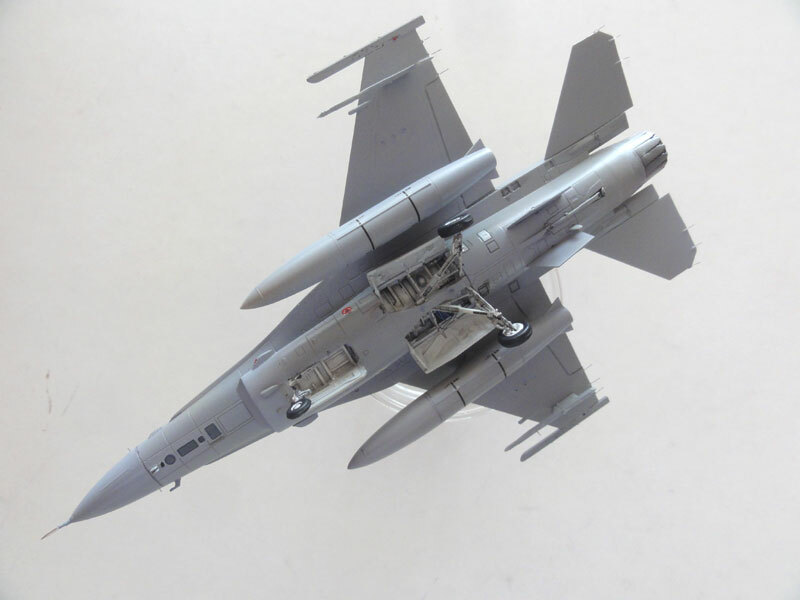 So modelling your particular desired Block 62 F-16D will need studying real F-16D photos to see what is needed. The instructions are very unclear at particularly the undercarriage assembly. So you will need some "F-16 modelling experience" or check photos (such as on my own F-16 Walkaround...). 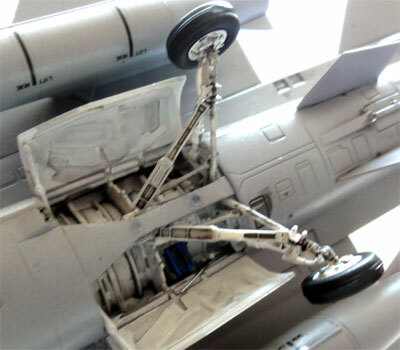 There are only 6 sprues indicated in the parts layout but there are more sprues for the stores with pylons, bombs and missiles like the GBU-24, ALQ-14, ALQ-13, IRIS-T (for Poland F-16D). Some of these are welcome indeed. But no advanced AIM-9X Sidewinders are provided. The later style correct LAU-129 missile wing tip lauch rails are provided though. 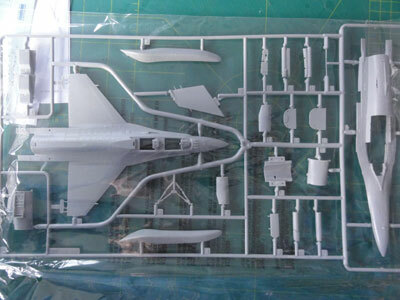 (NOTE: the F-16I SUFA kit #72001 has another extra sprue with specific parts and also some stores like a Python missile and some special Israeli sensor pods). Take care as a sprue labelled B is also another sprue B so leads to confusion. The long two seat canopy is untinted and its sprue is not packed in a separate bag, so my canopy was scratched! Polishing is thus needed. 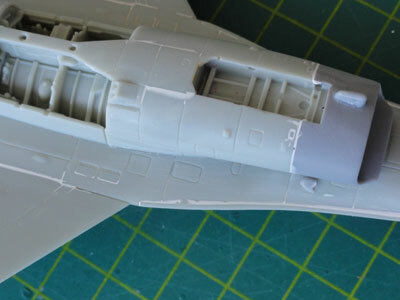 Some air forces have a tinted canopy, so you need to check this and when needed do this than yourself (e.g airbrush thinned Tamiya Clear Smoke paint). The fuselage looks good with also the lower mostly standard chaff flare dispensers well engraved in front of the air brakes between stabilizers and wing trailing edge. 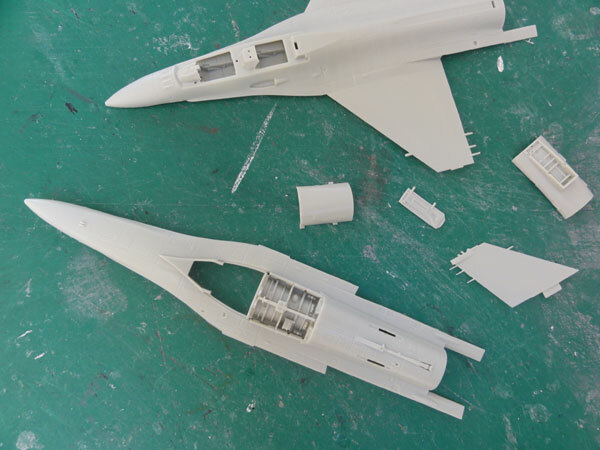 The typical large fairing / spine on top of the fuselage is separate and made of a few parts and can be installed (or left off for other block F-16's). The cockpit is small and has raised detail on the side consoles and instrument panels. The ejection seats have no harnesses but look good when some detail is added. The two separate Conformal Fuel Tanks (CFT) to be fitted onto the center fuselage are nicely provided as separate parts as well and can be fitted or left off as desired. 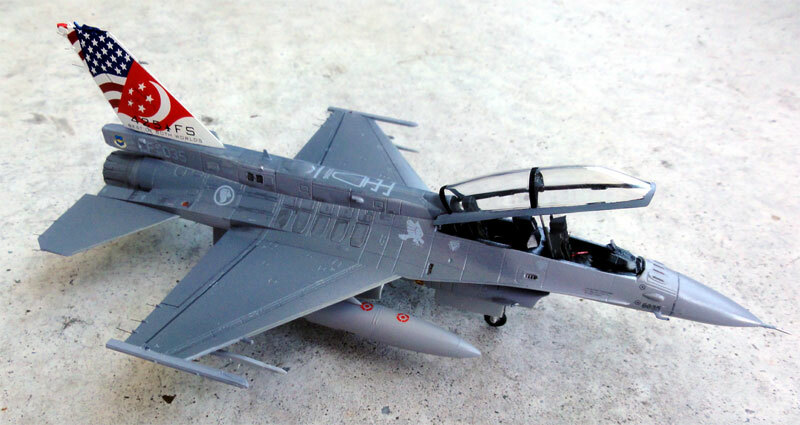 The long range 600 gallons larger under wing fuel tanks are also nicely provided in the kit with slightly different pylons with an angle at the rear; these tanks are often used on later Block F-16's including Israeli F-16I SUFA. (but in this Kinetic kit no standard 370 gallon tanks with their pylons are included so source these from other F-16's kits if needed). The real F-16 Block 52 had a beefed up landing gear as the aircraft is heavier than earlier blocks. The landing gear in the kit has correctly bulged main doors though on the parts not very noticeable and also slightly thicker main wheels though they seem still a bit too thin. The lower wing halves show large ejector pin marks, these definitely need filler! The static dischargers on the trailing edges are rather thick, so better replace these; cut them off and make them from thin fishing line as a final finishing stage. 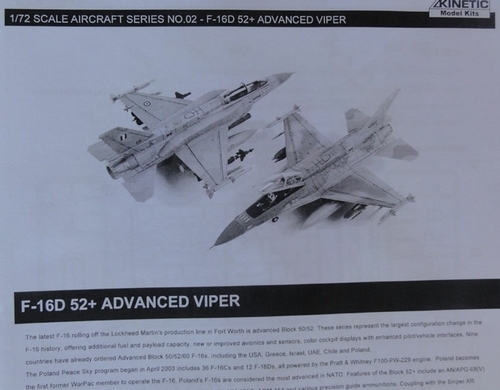 (2) Poland F-16D Block 52 in a 2 tone scheme with Fed.Std FS36270 and 36375. The schemes are rather simple but a lot of detail markings and stencils are provided on the decal sheet. The fuselage parts with the integrally moulded upper wing were warped. Probably their sprues in my kit came out of the moulding machine too fast. Some bending will solve this. There is some flash on tiny edges on some parts but a file and X-acto knife quickly deals with this. 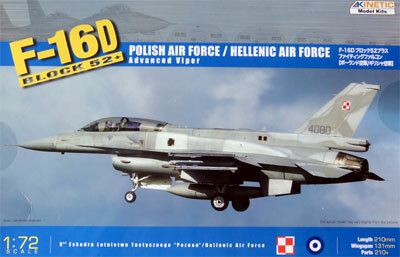 (A few KINETIC F-16D models will be made, also for Greece / Hellas and Pakistan, see later update on page 14...). 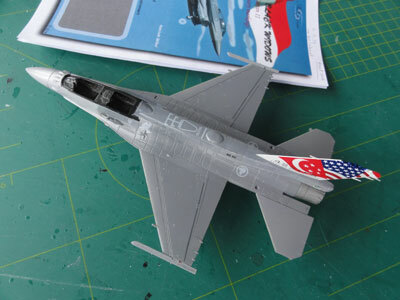 I started with a F-16D Block 52 of SINGAPORE using other after market decals. 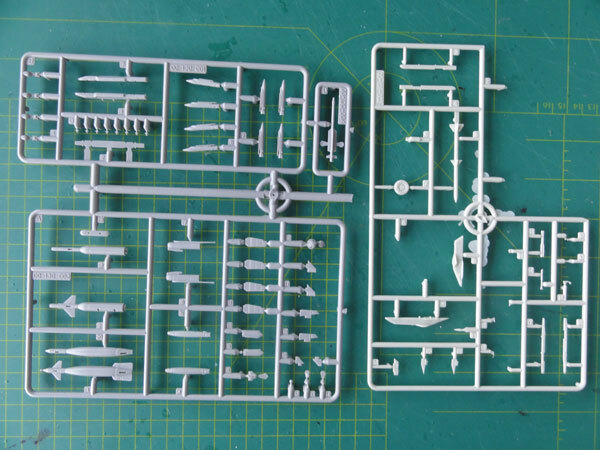 Parts have rather thick sprue attachment gates so use a razor saw to seperate the parts from the sprues. The cockpit looks good with engraved console detail but this needs painting as no decals are provided. Part #B16 is wrongly labelled, should be #D15. The sides of the cockpit tub reveals awkward inside gaps at the rear, these were closed with thin plastic card. The main undercarriage bays are detailed well enough including the battery. The main upper fuselage and wing with the appropriate leading edge RWAH "beer can" antennas is one piece so will give a good look but the warped parts need bending; ensure a wing without an angle so no dihedral and ensure that the rear airbrakes (which can only be set closed) are horizontal and symmetrical. The wing edges were opened up with the TIGER razor saw for a more realistic look. The small style air intake as provided for the updated F100-PW-229 engine is correct and is deep enough. But the plastic of the fairing does not meet the fuselage lower "tri-angle" area, resulting in a gap. I removed and trimmed the plastic on the mating lips to ensure a better fit. A strong clamp is needed after glueing and a long drying time to close the gap. Please do this, this will save a lot of trouble. Do not yet fit any undercarriage parts to avoid damage. The main gear legs are one part #C5, I separated the legs in order to fit the lower belly part #A6. Always set these on at a final stage. I engraved the main flap line a bit deeper both on the upper and lower wing with a scriber. Fill and sand the awkward ejector pin marks on the lower wing. Also fill any pylon holes if you don't fit pylons and their stores. The central pylon does not fit very well. Part A6 will be fitter when scraped off a bit on it's inside. The lower wing-fuselage joint needs filler to close the gap. Also fill the ejector pin marks later on. There are some optional fairings seen here, not well indicated for a particular version. Check photos as which of the parts #D23, #D24 is needed. The side intake light stubs parts #F12 are better fitted later on after sanding the intake. The exhaust fairing in front of the gearbays is not shown in the instructions but is provided. The aft horizontal stabilizers look a bit "rough" but can be used after removal of the thick static dischargers; these will be replaced and made finer at a final stage. The aft exhaust part #D35 and its rear fuselage section joint results in a big step. So a lot of sanding is needed here. The exhaust itself for the upgraded Pratt and Whitney F100-PW-229 looks a bit simple but painting can improve how it looks. The gun nozzle part #D34 does not fit very well. Some will be hidden if the CFT's are fitted. The large fuselage spine fits OK onto the fuselage but there is an ugly gap/ ridge on top. Fill and sand. Also check out the particular antenna layout and intake scoop configuration on your desired F-16D for your desired air force. The rear part #F3 varies! Part #F2 is also supplied on the sprues and applicable for e.g. a Greek Hellenic F-16D which seems a sort of sensor. The tail fairings #F4, #F5 are also not standard; for a Greek only one part to be fitted on the right side, Singapore or Pakistan F-16D not applicable at all! So fill the locator holes. The ejection ACES seats look OK without moulded harness but these can be added made with tape. The cockpit detailling and the canopy will be dealt with later. The pair of Conformal Fuel Tank (CFT) on the upper roots are separate and not always fitted. Bend these a bit and they wil fit much better. Some white glue is needed that will close any CFT gaps. The designator AN/AAQ-13 pod is nicely provided but needs filler! Shown are the larger Israeli underwing 600 gallon long range fuel tanks. The fuel tank pylons parts #B20 are not the standard ones. 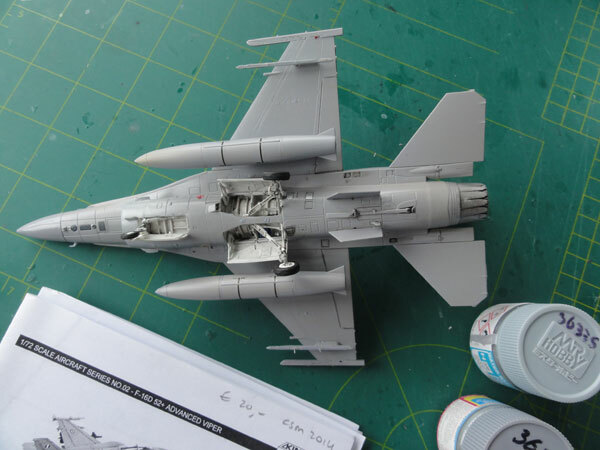 So when you want a particular F-16D of an air force with the standard tanks, source the standard 370 gallon fuel tanks and pylons from another F-16 kit (like from Revell or Hasegawa). This step deals with the tanks, pylons and stores as desired. The later LAU-129 wing tip missiles launch rails are the correct advanced (AMRAAM AIM-120 capable) type. Many other pylons and launchers are also in the kit (though not indicated). Also check if the intake pods like the AN/ALQ-13 and ALQ-14 and fairings are applicable for your desired air force F-16. For my SINGAPORE model I will keep the configuration rather "clean". Some white glue will close any gaps. When the overall assembly was ready, some limited amounts of filler / putty were surprisingly only needed. I used some on the nose, the upper spine, intake and the wing-root gaps. Tiny gaps were filled with white glue. The model got now a coat of grey base coat with the airbrush to check for any flaws. 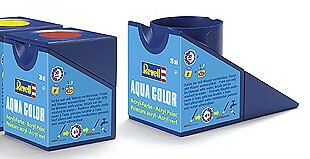 Often I airbrush thinned simple Revell Aqua acrylic 75 "steingrau". Any left errors were corrected. Some work was still needed on the spine! But, generally a kit that needed remarkably only a little putty when assembled carefully. 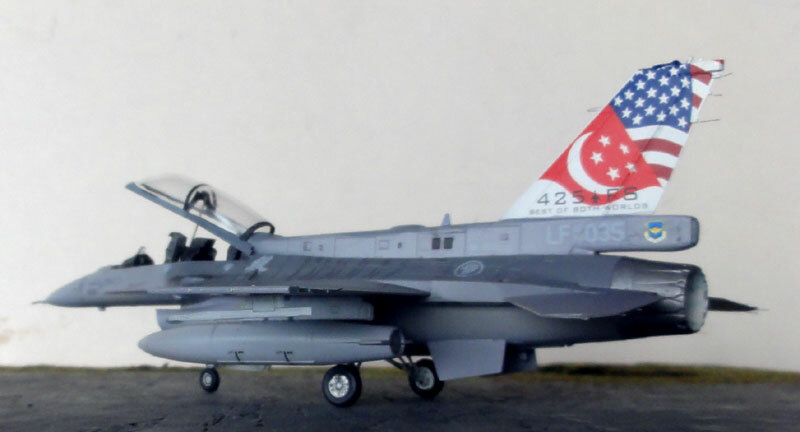 The first Kinetic F-16D Block 52 model was finished as SINGAPORE AF aircraft and kept rather clean. It has indeed the advanced Pratt and Whitney F100-PW-229 engine with still the small style air intake, fuselage spine but often not the CFT's. Standard 370 gallon fuel tanks are not in the Kinetic kit, so nice ones were retrieved from a Revell F-16 kit. The upper spine of STEP 8 was obviously installed (but later I saw that I forgot to reposition the smaller antenna on top; it should be moved more aft in front of the vertical tail). Also, sometimes a sort of scoop intake is seen at the left side of the spine. No parachute is fitted probably so use indeed Kinetic part #F3 at the tail base fairing end. I fitted no intake side sensor pods ( though they are in the kit). The lower chaff flare dispensers are also often installed in front of the air brakes between stabilizers and wing trailing edge. The cockpit interior was painted medium grey but also large parts in black and this is a night mission capable F-16. 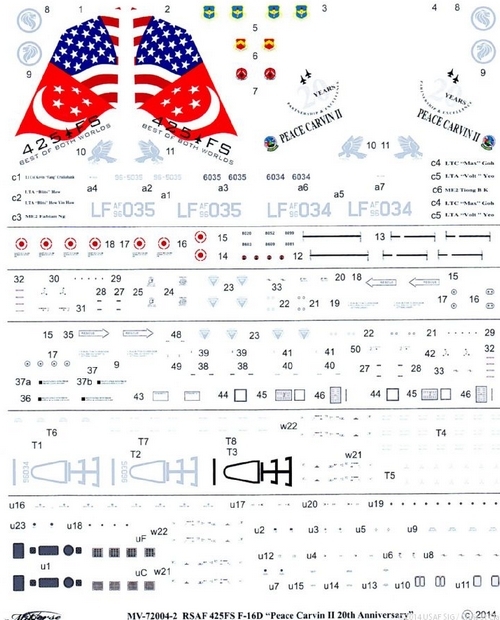 I purchased decals from Miliverse, set MV-72004-2 for RSAF 425 FS Black Widows issued. 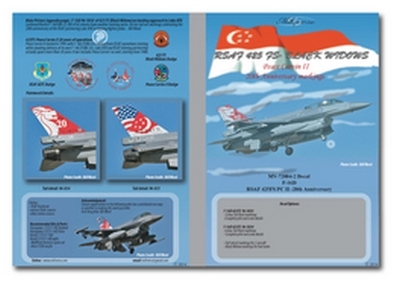 Because of Program Peace Carvin II - 20th Anniversary, two RSAF F-16Ds got applied coloured tail flash designs. The scheme choosen was for a Singapore air force aircraft used for training as based in the USA at Luke AFB. The aircraft is the flagship of the no.425 Fighter Squadron. The decals are really good though not cheap but Milliverse really does its homework (their website is: http://www.miliverse.com/index.html ). Plenty of tiny stencilling is also on the sheet with excellent instructions. This required some simple masking while applying these colours. 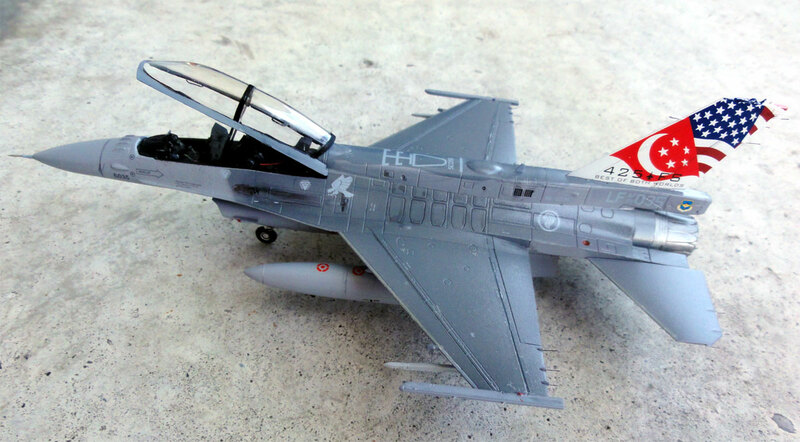 The wing and stabilizer leading edges often have a FS36270 coloured stripe (this is a decal in the set). 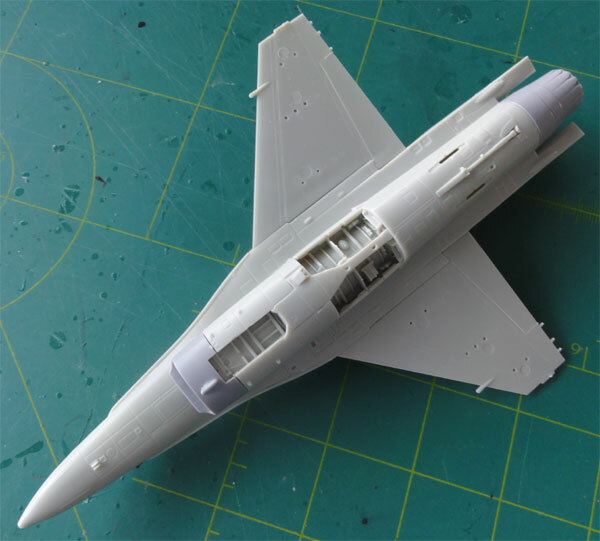 The upper vertical tail got a white undercoat for the flagship scheme. The typical walkway stripes were not seen on this particular F-16, only a line in front of the flaps. Decals were commendably thin and went on fine. The canopy in the box was scratched so polished with a nail polisher block. It looked untinted so kept this way. I was not sure about the canopy tints. Photos sometimes show the forward pilot section to be tinted and the aft system operator/ instructor section untinted. I simply used the kit clear canopy. 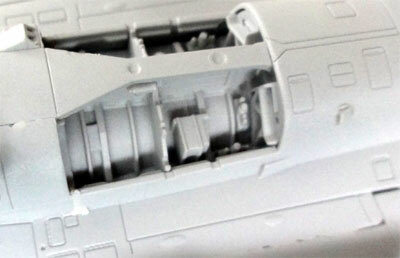 Inside the canopy 2x2 handles were added from black sprue, these are missing in almost all F-16 kits. The installment of the undercarriage is unclear from the instructions. 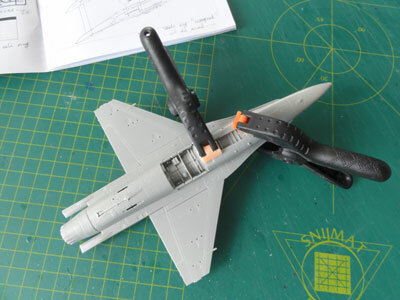 See my previous made models and "your own F-16 gear assembly experience". The gears and wheel bays were painted white and got a wash. Also some engraved fuselage panels got a wash (using PROMODELLER wash). The some 15 static dischargers (that were first removed as too thick) were added made from thin fishing wire and painted dark grey when dried. The outboard wing pylons were set in place, but without weapons, only the other fuel tanks. The model was kept "unarmed", used for training only. The nose pitot was made from a metal needle and the right side pitot aft of the nose installed. Some store braces were added, made from thin wire, on the pylons. Anti-collision lights were painted red and blue. The model finally got a semi-matt coat.... . This gives an even sheen and looks realistic. The ejection seats got a harness with straps and belts from tape and set in place. Note the inside canopy 2x2 handles were fitted made from thin sprue. 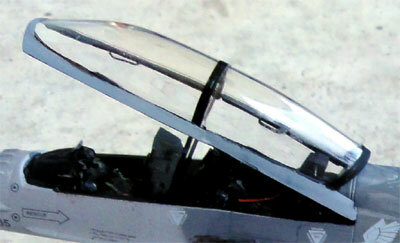 The canopy was set in place and that completed a nice F-16D block 52 of no.425 Fighter Squadron, SINGAPORE AIR FORCE. Normally it is based in the USA. 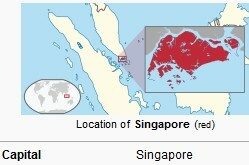 Singapore is an island city state republic and became independent from Britain in 1963. 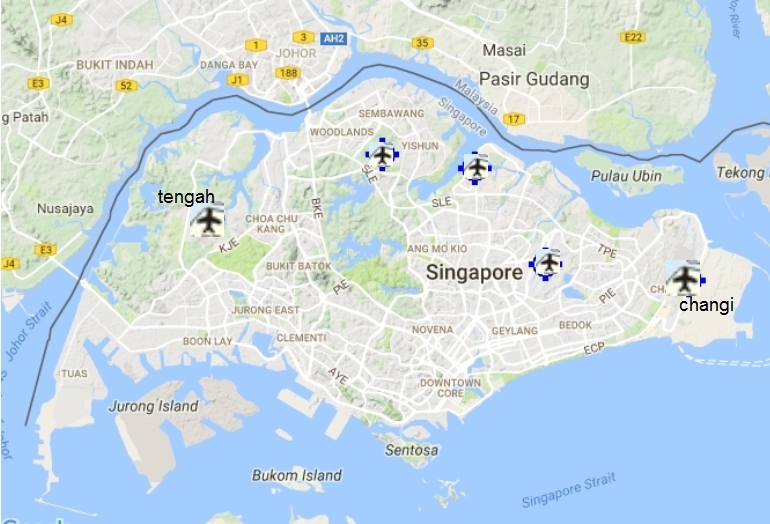 The Singapore air defense command was established in 1968 and was renamed air force in 1975. Before that the defense relied on British forces. The first jet aircraft were Hawker Hunters delivered in the 1970s. Also BAC Strikemasters and A-4 Skyhawks followed in 1973 and even the SIAI S.211 jet trainer was used as in the eighties the air force was given a big boost. In 1980 the first F-5E Tigers were acquired so Hunters could be transferred to a ground attack role. 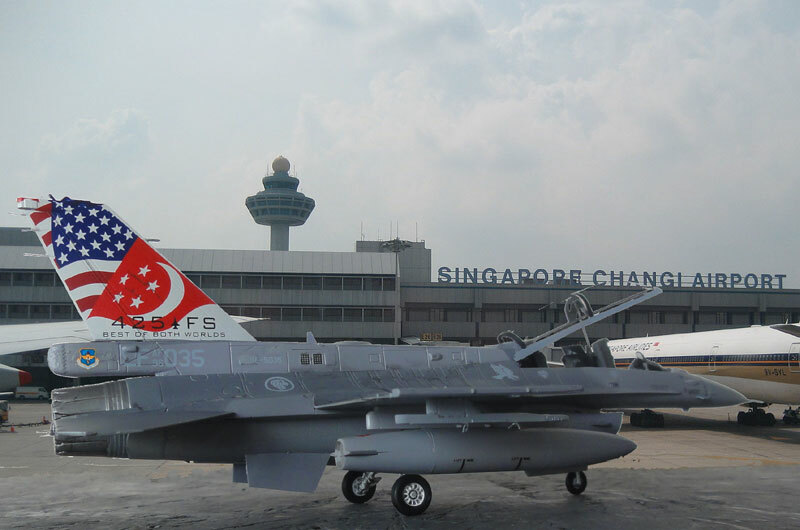 The Singapore air force obtained their first F-16 aircraft way back in 1988 with sort of block 15 (with block 30 fuselage) aircraft under Peace Carvin I program. 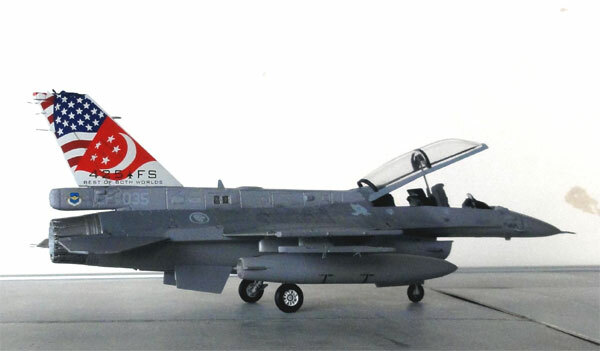 In 1998 delivery followed under Peace Carvin II for more advanced F-16C and F-16D models aircraft. 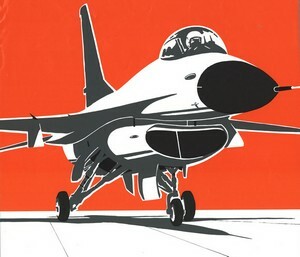 Starting in year 2000 Peace Carvin III and IV newer aircraft were delivered with about 50 F-16C and F-16D Block 52 aircraft flying from Tengah AFB. They can be armed with AIM-120C5 or C7 AMRAAM and AIM-9M Sidewinder missiles along with smart bombs like GBU-10/12 and Mavericks and the LANTIRN pod or later Rafael LITENING III and AN/AAQ-33 Sniper targeting pod. In the dorsal spine probably advanced ECM systems are fitted. From 2016 a further F-16 upgrade program started to install a new radar , Link 16 and to use the GBU-39, JDAM and a helmet integrated JHCMS with the AIM-9X. Another important fighter type in the relatively big air force is the in 2010 delivered F-15SG Eagle. Also, the Defense force operates Fokker 50 Enforcer mk.II maritime patrol aircraft that can fire Harpoon anti-ship missiles. F-16D Block 52 , no.425 FS of SINGAPORE AIR FORCE based at Luke AFB, USA. "on the scene... during a visit to Changi airport Singapore. Operational unit based here is no.145 squadron".